This marks the 8th anniversary of SnoBall and where GLRE got started. For 2019 we are currently limited in size as in the past. The 2020 SnoBall is the 8th Annual premier winter Raptor Run/driving experience. Some of the greatest memories and stories of Raptor adventures have been created during the past SnoBall’s. The same as past events since 2016 The SnoBall we will be staying at a centralized hotel in the UP, the Island Resort and Casino. At the 2020 Snoball you and your Raptor will encounter everything that Mother Nature and the Upper Peninsula of Michigan can throw at it. There will be areas of two track roads, logging trails, forest service roads and country roads. These roads will have varying degrees of snowfall on them, from significant snow fall to minimal/scraped country roads. From the moment you put the SnoBall official placard on your truck you are in for one of the most unique and exciting weekends ever. This is not a race we will stay together as a pack and work as a team to insure everyone makes it to each destination. We have made some significant changes to the format and route this year. There are 3 specific routes, allowing only 2 groups on each trail at a time. This will minimize waiting and backups due to deep snow, stuck or broken down vehicles. As always, Dishno and other roads north of Champion are part of the planed route. Great Lakes Raptor Excursions has chosen some of the most capable and experienced drivers as your group lead and chase trucks. You and your Ford Raptor will explore over 700 miles of the picturesque Upper Peninsula of Michigan within your group of 15 other Raptors. Lead and Chase trucks are outfitted with first aid kits, extraction equipment, VHF radio communications, GPS navigation and trail knowledge to get everyone to the final destination safely. But the driving isn’t the only appeal to this run. We will also be staying at the nicest Hotel/Casino in the Upper Peninsula, The Island Resort and Casino. *****Please no Air Horns in the Casino. Please visit us on The SnoBall page. There will be a mandatory SnoBall kick off and registration from 8:00pm to 10:00pm in the Eagles at the Island Resort and Casino during which time there will be vendors showing off product and talking about future plans There will also be an Cash Bar. This is the day everyone has been waiting for!!!! At 8:30am there will be a drivers meeting to go over some basics and so that everyone is on the same page. More Snow, More Cold, More Fun! 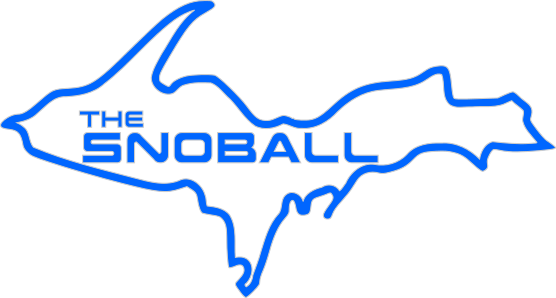 2000 EST: SnoBall Banquet/ Awards presentation in the Island Resort and Casino’s banquet room, there will be a Cash Bar open at the banquet. $525 -per Truck/Driver and Co-Driver: Includes 2 SnoBall Winter Apparel Items(Might do something other than Sweatshirts this year) The SnoBall Placards, and entrance into SnoBall closing event. 100% Sober Driving. Alcohol consumption will not be tolerated on trails or anytime you are driving. Remember these are state/public roads. If caught you will be asked to leave. Know the limitations of your driving ability and your Raptor for the conditions. FUEL YOUR TRUCK UP EVERY EVENING!!!!!!! First and foremost every truck, Driver and Co-Pilot must be ready for the Ultimate cold weather Raptor Run ever planned. A positive attitude goes a long way. We will stay as a group though out this event and arrive at each destination as a pack, this is NOT a race. There will be times where the group is moving along great and other times where someone is stuck. The person stuck could be you one of the times so get out and help your fellow group members, its part of the appeal. Being as it is winter there maybe changes along the way depending on snow level for better and worse. Snow is the key to this trip, while it will be fun with minimal snow, blizzard type conditions make it unbelievable. Please keep an open mind and be prepared to be a part of the best cold weather Raptor Run ever planned. Good tires: With a lot of tread remaining. Navigation: Lowrance, Garmin, iPad, or Android tablet with an off-road map app.